Slopeside condo - ski in ski out. Quiet side of mountain with tree views! The Aspens is located right on the slopes of Blackcomb Mountain- Upper Village of Whistler. A true ski-in, ski-out accommodation close to everything Whistler offers! The new gondola, seconds away, takes you up Blackcomb! In under a 2 min. walk down the mountain you are at the luxurious Fairmont, Chateau Whistler where you can enjoy a luxurious evening at Mallard's Lounge or whilst the day away at the fantastic spa. If you want casual, enjoy a pint or three at the Merlin's Pub also right there. At this bustling base of Blackcomb, purchase your tickets for skiing, snowboarding, sightseeing, etc or people watch in one of the many restaurant/pubs. Ski out from the Aspens and you're at the new gondola in seconds where you'll be transported to the amazing views up on Blackcomb & Whistler mountains. If you don't feel like walking down to the amenities or to the central village, take the free shuttle just outside the Aspens. There are front desk staff to assist you with all your concierge needs. Amenities at the Aspens include a large, heated pool, three hot tubs, exercise facilities, coin-operated laundry, multi-purpose room, on-site ski valet, Summit ski rentals and ski shop, complimentary bike storage and safe, underground parking. Summer Activities in Whistler are abound such as: golf, canoeing, kayaking, swimming, hiking, biking, mountain biking, glacier skiing, zip-lining, spas, whitewater rafting, eating, drinking, dancing and exploring all the shops, sights. Winter activities include: skiing, snowboarding, cross country skiing, snowmobiling, horse ride/fondues, skating, hockey, heli-skiing, snowshoeing and more! Jayne, Wes & daughter, Chloe love going up to Whistler for fun, relaxing weekends, and of course to ski. It's so awe-inspiring and one of the most beautiful places in the world. The Aspens is the most premier location in Whistler/Blackcomb. Skiing right outside the door is so convenient. The hot tubs are amazing right on the slope side as well. It's a real chalet feel. Air conditioned to keep you comfortable in the summer months. Brand new Blackcomb gondola for 2018/2019 seconds away! Usually there will be olive oil, spices, tea etc. Three hot tubs to choose from! We had a wonderful stay at the home in Upper Village. This truly is a ski-in, ski-out, as advertised. The home is comfortable, cozy, and immaculately clean. It's very close to Upper Village and a short walk to Whistler Village. The kitchen is well-equipped. The pool and hot tubes are great after a day on the slopes. The Ski Valet is useful, but keep in mind the line might get long during busy times. We hope to return to the same property next ski season! Glad to hear you enjoyed Whistler, Diana. Welcome back someday soon. What a wonderful stay we had here. So close to everything and a true ski in ski out. The unit was clean and modern with a big comfy bed. The kitchen is fully equipped for your stay. Jayne was a wonderful host and willing to answer any questions and gave some great tips for places to eat and things to do. We loved the hot tubs after a long ski day. Thank you we will be back. Lovely place. Great stay. Look forward to coming back. Thank you for staying with us, Dennis. Look forward to hosting you again in the Spring. The first big bonus is that the Aspen is situated in the upper village of Whistler. That means it’s more quiet and less crowded. Whistler in August is very popular- very much people are here. The condo was beautiful also situated on the right quiet site of the Aspen Hotel. It’s very comfortable and we slept well. Also the kitchen has a good equipment including dish washer, microwave and also Nespresso cafe machine. Unfortunately we didn’t know this in advance and didn’t have had Nespresso cafe with us. We have had a problem with the fan in bathroom and as soon as we have informed Jayne she organized to repair the fan. We like to say thank you again for this fast help. We enjoyed very much our tour to the mountains. The new suspension bridge is very impressive and the Peak-to-Peak-Gondola is really a must in Whistler. In only a short walk we can reach restaurants and grocery store. All in all it was a very nice stay and we enjoyed very much this nice condo. Thanks for staying with us, Ute and thank you for your kind review. Sorry I neglected to inform you of the Nespresso. That was a recent addition, so I had not thought to mention to guests with future stays. I will do so. 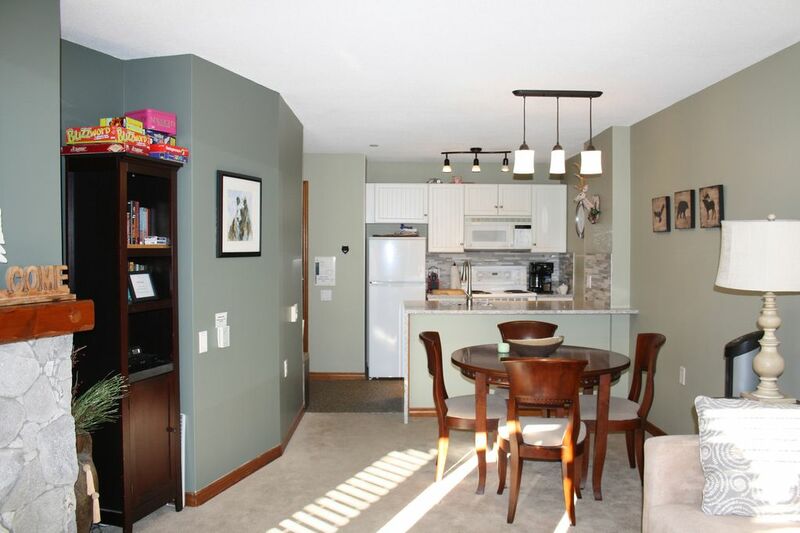 Very nice, comfortable condo and great location! Complex was nice - nice pool and jacuzzi area. Enjoyed our stay very much!